When one, single part of your body is not working properly, your whole body can feel it. The same applies to your house. 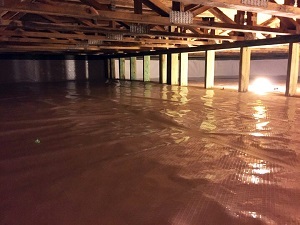 When your crawlspace (or any space, really) is not functioning as it should, your entire home feels the effect. If your sub-floor space is infected with mold, caked with mildew, subject to rot or moisture, or has structural problems, your house will not be "up to snuff". 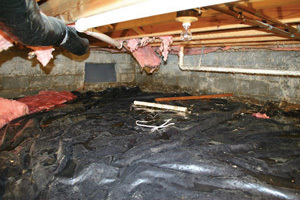 Lawson Home Services has the solutions to your crawl space problems. We offer free crawl space repair quotes throughout Delaware & E. Shore Maryland, including Bear, Wilmington, Dover, Salisbury, Newark, Easton, Middletown, Claymont, Berlin, Hockessin, and surrounding areas. Symptoms of a Crawl Space Problem: We Fix Them All! 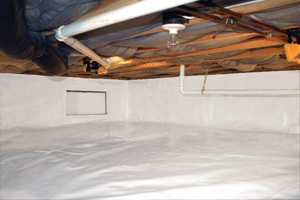 Since crawl spaces are infrequently used they are easily and commonly ignored by most homeowners. However, studies show that fixing crawl spaces can save up to 20% in heating and cooling costs because less strain is placed on the systems daily output. If you have experienced any of the following, please contact us right now! Whatever the problem, we have the products, the know-how and the service to solve it; quickly and efficiently. By repairing your crawlspace, you are saving money on future repairs, saving money on your utilities, and making your home a healthier place to live. As a Dr. Energy Saver franchise we are all about providing you with the solutions to add comfort to your home but health and savings as well. Upgrading your crawlspace will be a wise investment for years to come. Your free crawl space repair quote includes an on-site inspection, professional consultation, and written quote. We also do a lot of work repairing crawl space doors also known as crawl space entry systems. We find these doors either rusted out, cracked open, unable to open, and even unable to use to get into the crawl space! We have the solution! We install a unique product called The Turtl™ and it is the perfect upgrade for your crawl space. Ask more today! Lawson Home Services proudly serves Grasonville, Seaford, Stevensville, Centreville, Georgetown, Lewes, Millsboro, and surrounding areas in Delaware & E. Shore Maryland.